I recently came across this image online, and I liked it a lot. The quote comes from an inspiring publication called ‘Life’s Little Instruction Book’ by the American author, H. Jackson Brown Jr, and for me it makes a lot of sense in the context of today’s globalised society. …Sadly, there have been numerous occasions in which I’ve been abroad and felt embarrassed by fellow Brits, who just steam-roll into shops or restaurants and start booming out requests in English, expecting an immediate response and showing visible frustration if one isn’t forthcoming. How difficult could it be just to learn – at the very least – one simple translation of “Do you speak English?” before rattling along with an urgent order of steak and chips? Not all of us can pick up foreign languages, I know I struggle (and was explicitly told NOT to do German A-Level by a horrified looking German teacher when I mentioned I was considering it); but one simple sentence is all it needs to take to distinguish between common courtesy, and latent ignorance. 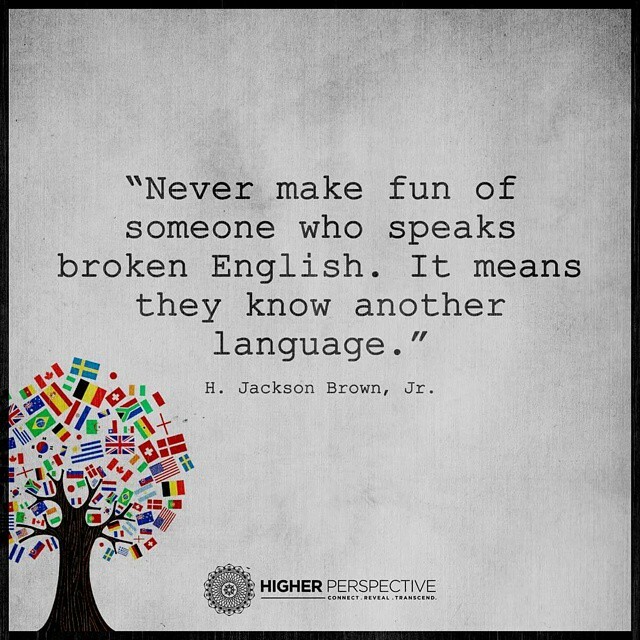 I will always have the utmost respect for those who persevere at learning other languages to the point where you feel that you can hold a conversation with them that knows no boundaries. When I did the volunteering out in Indonesia, I was the lucky one. English was, again, considered the universal language of the project, and I was the only one for whom it was my native tongue. I can honestly say that some of the best conversations I’ve ever had were whilst out there speaking with the Indonesians and the other trainees, who came from all over the world. I felt able to speak amongst those people as I would around people from home, such was their impressive command of English, to the point where I would often forget about the language barrier altogether. I could never imagine being able to speak another language as well as they did English, and for that I feel a sense of shame. It’s one thing to know how to describe the town you live, or to explain that you enjoy going to the cinema on Fridays and eating ice-cream, but if that was the limit to which everybody could speak a different language, then the world would be nowhere near as multicultural or diverse a place as it is today. There’s a whole chasm of difference between the lingual intensity of sentences like those, and the more complex sentences which form the majority of our conversations with our fellow Brits. We should just be grateful for the fact they’re trying!